If you're looking for a durable, inexpensive, breathable, manuverable chair, a Bungee chair could be a cost-effective solution for work or recreation. Our top pick is the collapsible Zenithen Bunjo Bungee Dish Chair. This 225 lb. capacity, 8 lb chair is exceptionally strong, its users say, and provides high-quality support whether you're watching TV or lounging outdoors on a balcony. A bungee chair is a chair that uses bungee cords attached to plastic or steel frames. The cords not only offer a distinctive modern look, but they conform to you body better than traditional cushions making them comfortable. Also, these cords give the chair “breathability” which can cut down on perspiration when you’re sitting for long periods of time (Source). While there are plenty of these specialty chairs on the market, buyers recommend looking for one that has a reputation for durability. Also, depending on the type of chair you’re looking for, make sure you get one that can support the weight. Lastly, if portability is a concern, buy a chair that can be folded into a compact shape for easy storage/transporting (Source). For this article, we looked at 5 bungee chairs that are best suited for kids, college dorms and tailgate parties where portability, strength and comfort are a concern. The first chair we looked at is the Bunjo Chair Bungee Chair Hex, which is a neat, modern hex design that would fit well in a college dorm room or kids room. The nylon webbing that makes up the seat conforms to your body shape making for comfortable sitting. It’s easy to fold and store and is rated for a maximum weight of 200 lbs. Next up is the Urban Shop Bungee Chair, which features a steel frame that locks solidly and securely, but is still easy to fold. 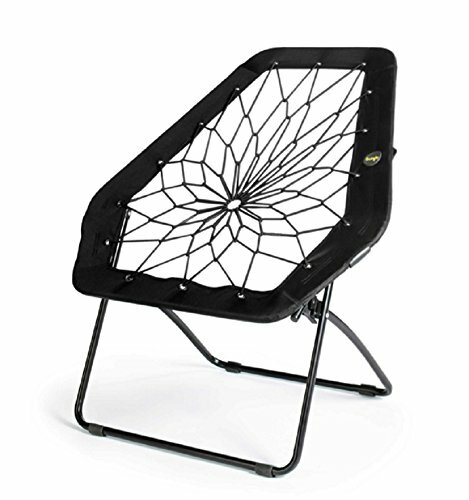 Unlike the Bunjo chair, the webbing here is covered in a plush material making it a bit more comfortable. This chair is rated for people up to 225 lbs. and buyers say it’s perfect for the kids room. The Giantex Folding Round Bungee Chair features a steel frame and is ideal for camping or tailgating where you need something comfortable, yet portable. The netted bungee cords combined with the steel frame can hold a weight capacity of 264 lbs. making this the strongest of all the bungee chairs we looked at. Buyers of this chair said it’s perfect for kids although some complained that the fabric rubs against the metal making a noise, which some found annoying. 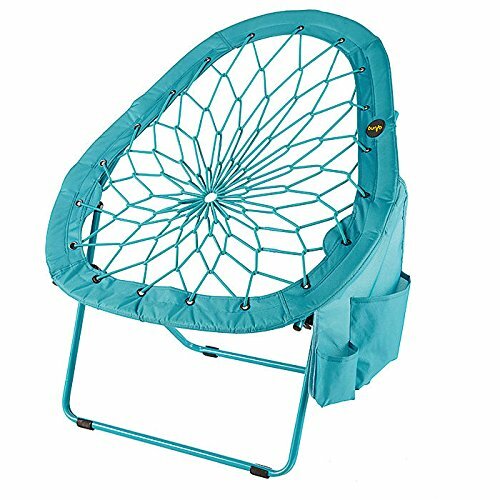 Super Bungee Chair from Brookstone comes in a variety of colors and features a built-in pockets where you can store a small books, magazines or your phone. This chair is very lightweight and most buyers said it is comfortable for sitting in for long periods of time. Last up is the Zenithen IC544S-TV04 Bunjo Bungee Dish Chair, which is able to hold up to 225 lbs. and its frame is made from durable steel. Like the other chairs we looked at, this one also folds to a compact, easy to store shape. The bungee cords are springy and allow you to “bounce” in and out of the chair and buyers said it’s ideal for the kids. If you’re looking for a top-rated bungee chair, you might want to consider the Zenithen IC544S-TV04 bungee chair. Users love the quality of this bungee chair, but some do complain of lack of coziness when sitting for longer periods of time. 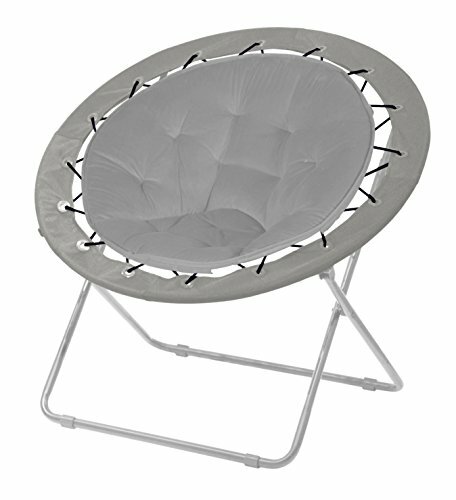 This product is a bungee dish chair with a durable steel frame fitted with netted bungee cords that make a seat. The manufacturer states that it conforms to your shape while providing enough resistance for stability. In addition, it is claimed that standing up is easier, thanks to the elastic action of the bungees. This item might be a good choice if you need a lightweight netted bungee seat that provides comfortable support. In general, buyers have a favorable opinion of the Zenithen bungee dish chair. They agree that it is comfortable, well-made and sturdy. Users conclude that the quality of the chair is great. However, several purchasers complain of poor reinforcement, stating that within two weeks the grommets were pulling away from the fabric. 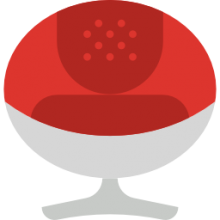 One online reviewer shares that it so not comfortable for sitting for a long period, especially not if you are a heavier adult. 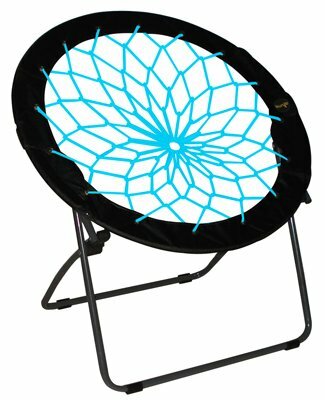 The Blu Dot super-bungee chair is a good option for those who want their body to be held at just the right angle for reading, gaming, snacking or channel-surfing. Users like how comfortable this chair is, but some complain about the durability. According to the manufacturer, this bungee web supports you like a soft, flexible hammock does. It features a built-in pocket for small devices and is said to fold flat for easy storage. It is available in pink, teal and grey/black color. This item could be a good choice if you’re looking to make sitting more fun. The general user consensus regarding the Blu Dot pear-shaped bungee chair is that it meets their expectations. Users agree that it is very comfortable, sturdy and well-built. They appreciate the high-quality materials that the chair is made of. However, some buyers complain about its durability, saying their item broke soon after the purchase. 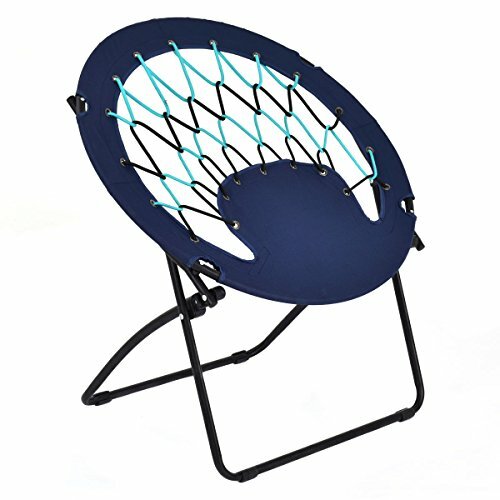 The Giantex folding round bungee chair could be a solid option for a teen room thanks to its unique design. Users love the sturdiness of this bungee chair, but some complain about the durability. This product, it is claimed,is made of high-quality materials which offer a comfortable seat. As the manufacturer boasts, its steel frame provides durability and has 264 lbs. weight capacity. The chair is said to be foldable and lightweight, which is great because it allows for easy transport and storage. It comes in four colors: black, blue, camouflage, and grey. This item, available in camouflage color, might be a solid choice for fishermen who want to enjoy their outdoor time. The general user consensus concerning the Giantex steel frame bungee chair is that it is well-made, sturdy and super comfortable. Purchasers appreciate that it folds up thin. However, several buyers share that their item broke in less than 3 weeks of use. Users don’t recommend it for bigger folks as they will sink down quite a bit and may have trouble standing back up. If you are looking for a bungee chair, you might want to consider the Urban Shop bungee chair. Users like the functionality of this chair, but some complain that it’s not a great fit for tall people. According to the manufacturer, this product features a cushion made from durable, plush upholstery and a foldable steel frame with a locking mechanism which supports up to 225 lbs. A useful feature is that you can fold it flat when not in use. This product might be a solid option if you are looking for a fun and comfy seating option in your bedroom, playroom or dorm room. The general user consensus concerning the Urban Shop grey bungee chair is that it is comfortable for kids or short people. They appreciate that it folds up nicely. However, some find it not so comfortable for taller people. As one 6’ 1’’ online reviewer shares, the outer metal bar digs right into his shoulders. He adds that the chair is very noisy when you adjust your position while sitting in it. The Bunjo bungee chair is a good option for someone who wants a stylish and functional addition to their apartment. Users like the chair for being comfortable, but some complain that it’s not suitable for kids weighing less than 70 lbs. This product features a metal frame with nylon cords woven through the center to create a fun seat that molds to your body. As the manufacturer boasts, it folds easily. The stated maximum weight capacity is 200 lbs. This item seems like a good choice if you want to give your living room a stylish accent. In general, users have a very favorable opinion of the Bunjo bungee chair. Buyers agree that it is comfortable, durable, lightweight and easy to carry. They recommend it for seniors since the elastic bands help you get up out of the chair by bouncing you up to a standing position. However, some buyers complain that kids under 70 lbs. cannot sit comfortably in it. As they explain, the bungee cords are so strong the kids slide off of the chair. When it comes to workplace recliners, there is a variety of options to choose from for the discerning customer. A bungee chair is a type of recliner that is designed ergonomically for use in the workplace. It is composed of a framework that is made up of taut bungee cord ropes or straps that are held between the outer parts of the framework of the recliner. This type of design for the recliner provides the person sitting on it with plenty of buffering/cushioning and some level of springiness. They also have divided between the rows of the straps which boosts the flow of air through the seat, which makes it easier to sit on it for longer periods of time in relative comfort as compared to typical office recliners. The standard structure of a bungee chair resembles the structure of most other ordinary workplace seats. For example, all the major components of the seats, such as the armrests, legs, and other framework parts are made up of standard recliner materials like wood, plastic, steel or aluminum. What makes these different from standard office recliners is their unique backrest and seating pad which consist of the tensioned and taut fibers, which is why they are called ‘bungee’ chairs. Depending on the specific style and design of the recliner, these cables/cords can be flattened or finished out in a rounded manner. In the past, these types of seats were very rare. They only started gaining popularity in workplaces around the world from the early 2000s and onwards. Because of the way that these ergonomic seats are designed, they provide the user with numerous options to expand the aesthetic as well as the ergonomic aspects of the recliner. The manufacturers have added this capacity for expansion as an innovative feature which allows these seats to be suitable for all kinds of offices and workplaces. Some workplaces decide to go for an aesthetically pleasing look for all of their office equipment and furniture, which is why they have become as popular as they come in all kinds of styles and designs. Since these chairs don’t have any cumbersome cushioning made out of foam, as well as their expansive capacity for modifications, they are a perfect choice to achieve an aesthetically excellent finished product. One of the main reasons why they have become so popular in workplaces is because of the high level of comfort they provide to the person sitting on it. This is especially good because being comfortable while working increases the productivity at the workplace. Standard office recliners do not have the spring level that these chairs have due to their straps and tensioned cords. The design of these cords is also such that the user can mold the recliner to fit their seated position, further adding to the comfort level. Another benefit that makes them better than traditional office recliners is the way the bungee cords are aligned. Their alignment allows for air to flow freely through and around the seat and backrest of the chair, which makes the user feel comfortable no matter how long they sit on the chair. This airflow feature is particularly helpful in warm or hot environments. Due to their popularity, it is not only office seats that incorporate the bungee cord design aspect. Now there are also other types of chairs available on the market which feature all the benefits of bungee chairs, such as lounge chairs or folding chairs.